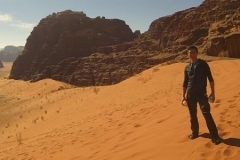 Join a Wild Wadi Rum Multi Day Tour in the desert! 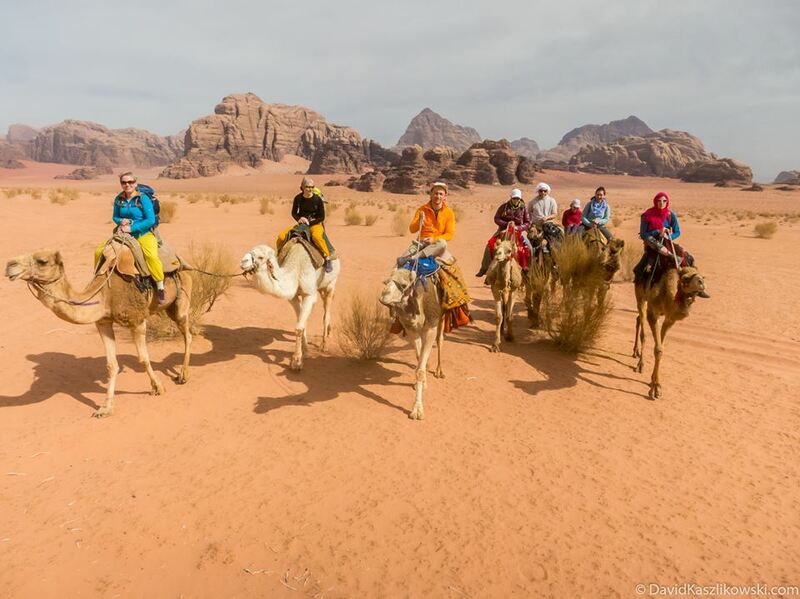 Our multi-day tours deliver a bespoke service that will take you around Wadi Rum’s most renowned sites. 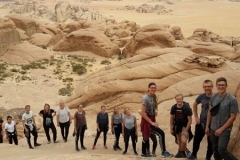 The custom tours will ensure that guests are shown around a broad variety of Wadi Rum’s highlights: the most magnificent views, ancient Nabatean sites, striking canyons, epic jabaals, rock arches and sand dunes. We will provide an unforgettable experience exploring the desert, travelling by camel, jeep and hiking. You will be introduced to Bedouin families who have kept their nomadic lifestyle, passing down their traditions and customs for thousands of years. Although we have planned our tours with great care, we welcome your input and are always happy to discuss and tailor a route specially for you. 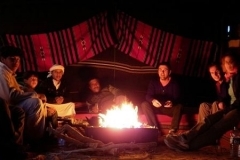 On your arrival in Wadi Rum, you will be welcomed into our home to finalise your route and get to know each other over some traditional Bedouin tea. If time permits we can also visit the nearby Shalalla Spring and the 2000-year-old Nabatean Temple, a brief hour round-trip walk from our house. Outside of summer months, lunch stops typically last about 1.5 hours but during the long days of summer months, our lunch hours are extended with a short siesta, the combination lasting a maximum of 2.5 hours. Since summer months receive more daylight hours, we are still able to visit the all the attractions listed in your tour! On tours lasting more than one night, visitors can choose to spend one night in the open desert in addition to the night spent in our camp. All tours are very flexible and can be combined to make longer multiple day & night programs. We can either add or remove overnight stays to tours to fit your needs. In Summer: sunscreen and a good hat. The first Wild Wadi Rum Multi Day Tour is one day and one night. This tour is the perfect option for those wanting to experience Wadi Rum’s highlights with less time. 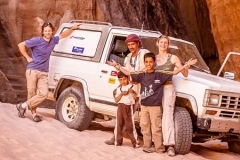 You will explore the desert by jeep, camel and on foot, providing an exciting and varied excursion. This tour starts at 9:30AM but if you are arriving in Wadi Rum in the afternoon, then you can stay in our desert camp first and start the tour in the morning. 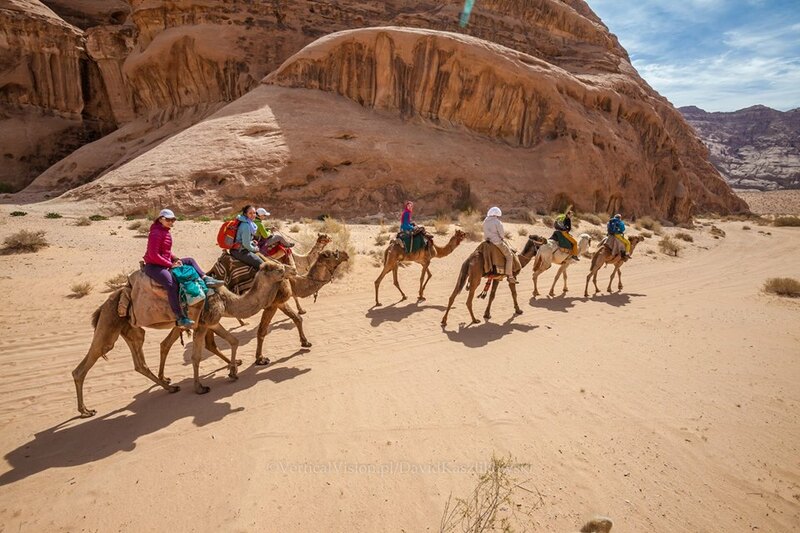 You will start the tour from our home in Wadi Rum village with a camel ride that will last around 1h. Within the first 3km you will be able to see the famous Lawrence Spring. Next, we will take the jeep to explore the deepest areas of the Wadi Rum desert. Here you will see the Red Sand Dunes, Anfeshiyeh Inscriptions, Lawrence’s house and the Mushroom Stone. After that, we will find a good place to rest, cook a meal and have tea by the fire. After lunch, you will take a small hike of around 30 minutes in the open area between the beautiful mountains. We then go back on the jeep to see Burdah Arch and the Abu Khashaba Canyon. There, we will walk again for about 30 minutes to appreciate the scenic landscape. We will then take you to see Umm Fruth Rock Bridge and the sunset view. In the evening, we will go to the camp where you will share a meal with us and spend the night. Next morning after the breakfast we will return to Wadi Rum village. This tour is aimed at those wishing to focus their trip around climbing. 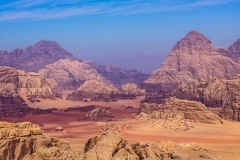 This second Wild Wadi Rum Multi Day Tour offers the chance to scramble Wadi Rum’s most exhilarating rock faces, canyons and arches. Visitors will also get the opportunity to visit sites of historical interest, such as Lawrence of Arabia’s house and ancient Nabatean heritage before settling in for the night at our desert camp. 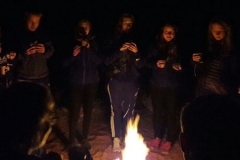 This tour start at 9:30 AM but if you are arriving in Wadi Rum in the afternoon, then you can stay in our desert camp overnight and start the first day of the tour in the morning. Starting from our house in Wadi Rum village by Jeep, we will see Lawrence’s Spring, the Nabatean Map, the Red Sand Dunes, the Anfeshiyeh Inscriptions and Lawrence’s House before lunch. We then go to see the Mushroom Stone and Burdah Arch. We will then drive you to the Umm Fruth Rock Bridge for a climb before camping for the night. The next day we will take the jeep to Burdah Arch and enjoy a 4 hour climb. Afterwards, we will visit the Small Rock Arch, Khazali Canyon and the Red Sand Dunes. We then finally head to the end our trip back at the Wadi Rum village. 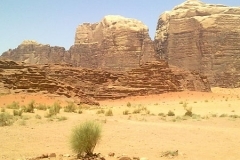 This tour is suitable for those wishing to spend two nights and cover larger distances within the expanse of Wadi Rum. Travelling by jeep allows the visitor to hike a broad range of the desert’s natural beauty, including canyons that are otherwise less accessible. 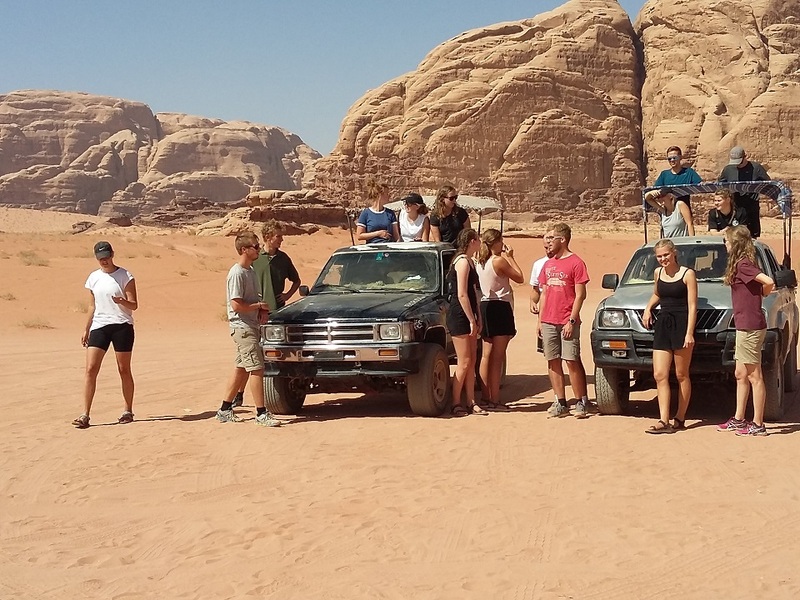 We start with a jeep from Wadi Rum village and go to see Lawrence Spring, the Nabatean map, and the sand dunes. After we will go to Barrah canyon by jeep and have lunch there followed by a short hike to a camp to stay for the night. The next morning after breakfast you will start by jeep to Burdah Canyon for 30 minutes to hike to reach a location where you can see the Burdah Arch. We will have lunch in the Abu Khasaba Canyon, after which you will start by jeep to see Umm Fruth Rock Bridge and then go to Abu Shaeeba canyon for an hour before ending the day. We return to Wadi Rum village the next morning. 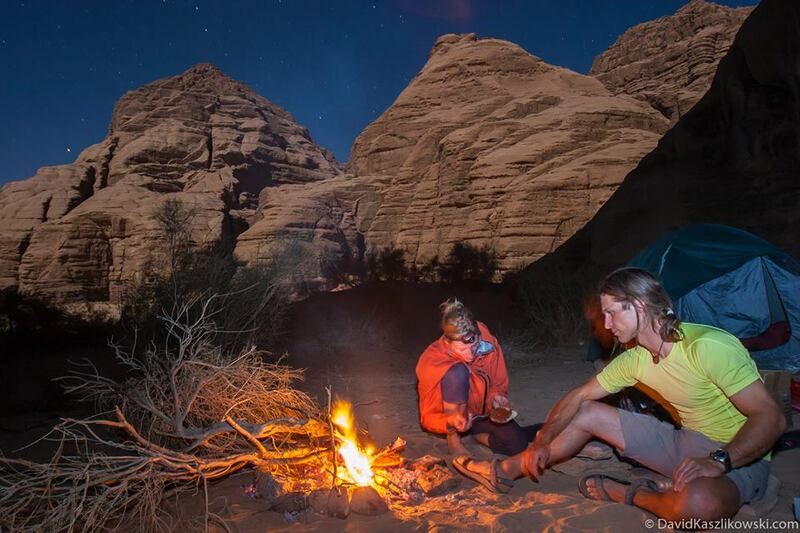 This Wild Wadi Rum Multi Day Tour is ideal for those who can stay for another day after sleeping in our camp. This tour certainly is varied and allows you to see many of the major sites in Wadi Rum by jeep, by foot and on ‘ships of the desert’. From hiking in secluded canyons and viewing ancient inscriptions carved into rock faces, to reaching stunning view points, every moment is different on this tour. 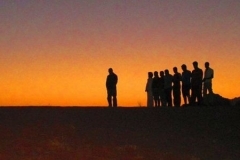 This day will start the tour by camel – exploring the desert in the Bedouin way. Enroute you will see Lawrence’s Spring, the Nabatean Map, sand dunes, Anfishiyeh Inscriptions and Lawrence’s house. On the way you will stop a great spot to have a rest and lunch. You will arrive by camel at about 4pm, from here you can enjoy the beauty of the area around the camp and in the evening. We will also have dinner and the enjoy the silence of the desert. Early next morning, we will take the jeep to visit Mushroom Stone, Burdah Arch and scramble to the top of Umm Fruth Arch. 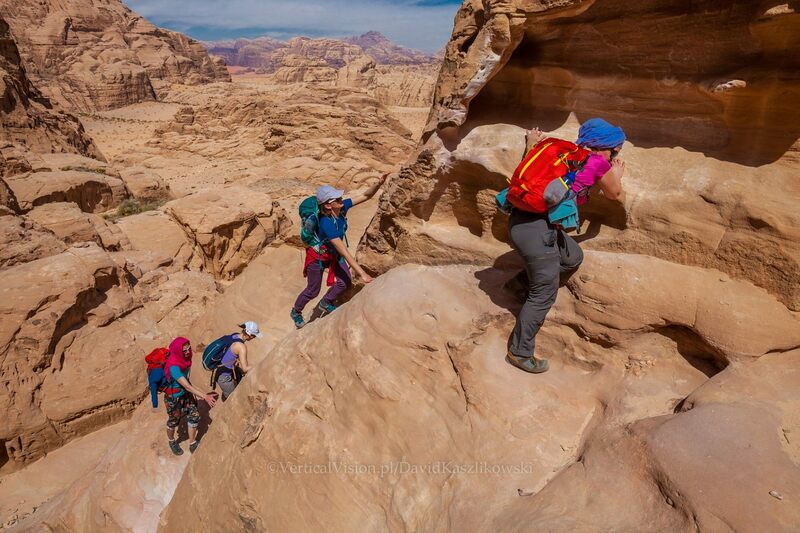 After finding a good place for the lunch we will have a 40 minutes walk through Abu Khashaba Canyonand where we will visit the small rock arch and khazali canyon before we end the day by returning to Wadi Rum village around 4pm. This fifth tour offers a more compact package compared to Tour three. Hiking will continue to be the focus; we will pack more walking into each day and our visitors will spend only one night in the desert. Additional highlights of Tour five include famous sites associated with Lawrence of Arabia as well as ascending the shady heights of Jebel Muharrag: a cool refuge after a long day of hiking. 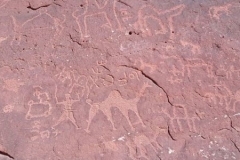 We will Start by jeep from Wadi Rum village to see ancient Nabatean inscriptions. Then we will take the jeep to Um Ishrin canyon to do some hiking, followed by a jeep tour of Burah Canyon. After that, we will look for a nice place for lunch. 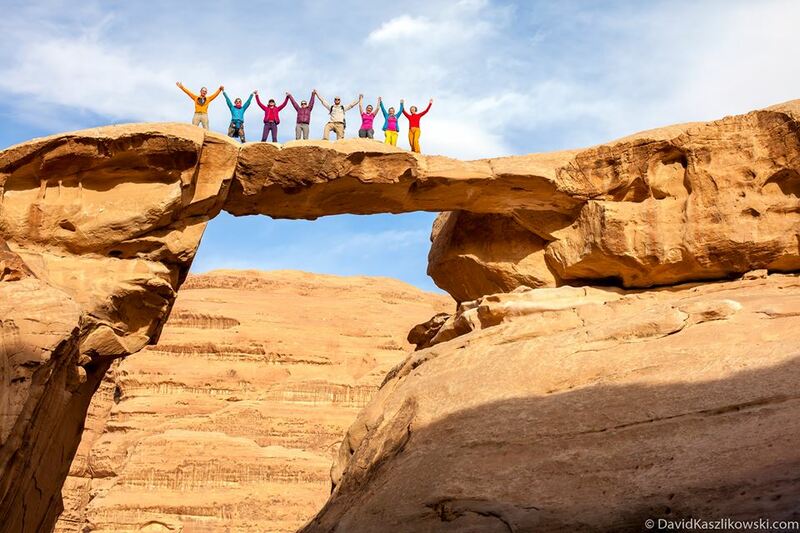 We’ll then visit the Mushroom Stone, Umm Fruth Rock Bridge, Burdah Arch, before we arrive at the camp. After breakfast, we start the hike from the camp to Abu Kashaba canyon then take the jeep to Geber Amra canyon. We will have a small hike here and then go to the small arch where we will do an easy scramble. 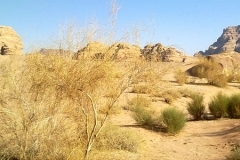 Following this, lunch will be in a beautiful spot in the desert, afterwards we hike out in the open to Khazali Canyon. Once we have enjoyed the canyon, we will take the jeep to Lawrence’s spring before we arrive back in Wadi Rum village at approximately midday. Our tour up the Jebel Al Hush mountain, one of Wadi Rum’s heighest peaks, provides stunning views despite the relative ease of the ascent. 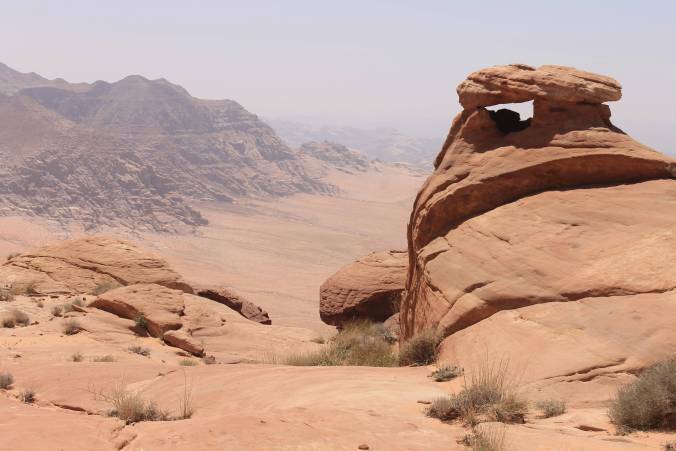 The Jebel Al Hush route features many of Wadi Rum’s other notable places of interest that makes for a rewarding excursion. We start by jeep from Wadi Rum to visit Lawrence’s Spring, and ancient Nabatean inscriptions before lunch. 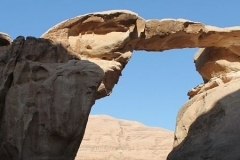 Afterwards, we will travel via jeep to the Abu Khashaba Canyon where you will do some hiking for around 30 minutes, ending at the Umm Fruth Rock Bridge. After 10 minutes of an easy scramble, we will go to a quiet place to watch the sunset before returning to camp. We begin via jeep through the largely deserted southern valleys and pass the huge mountains of the Protected Area. It will take around 30 minutes to arrive to Jebe Al-Hush, a high ridge stretching east to west for several kilometers. After walking along the top of the ridge for three to four hours along a safe, clearly marked path. After coming down we will take the jeep back to Wadi Rum village. 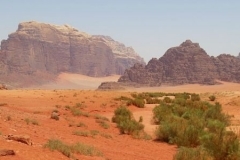 The Wild Wadi Rum Multi Day Tour is the Sunrise Tour, that allows visitors keen to get up early to view the sun set and rise from the best vantage points in Wadi Rum. Alongside this experience, visitors will also enjoy a day visiting a range of historical sites of interest and places of natural beauty. 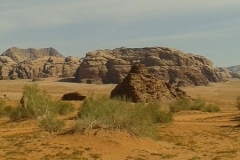 This tour start at 9:30 AM but if you are arriving in Wadi Rum in the afternoon, then you can stay in our desert camp first and start the tour in the morning. Children : under 10years old for free , under 15years old 50%. We will start by taking the jeep to Lawrence’s Spring and the ancient Nabatean Inscriptions. From here we will then proceed to the Mushroom Stone. After a spot of lunch, we will head to the Burdah Arch and then on to Abu Khashaba Canyon for a short hike. We will then go to Umm Fruth Rock Bridge to watch the sunset before heading to camp. Early next morning we will take the jeep to a prime location to watch the sunrise. After breakfast, we will take the jeep to Khazali Canyon and the Nabataean temple before finishing the tour around 10 AM. 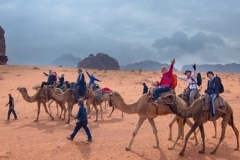 Finally, our last tour provides a chance to enjoy the camel ride under the stars or the moon light spending about 2 hours on the camel from the starting point of Wadi Rum village. From here you will travel to our bedouin camp in the desert . 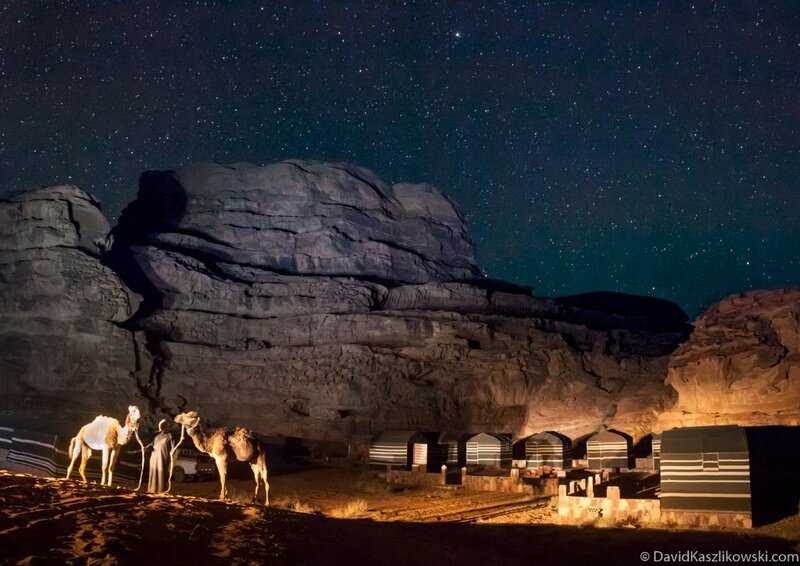 You should arrive in Wadi Rum village in the evening of the first day, where you will start the tour by the camel. This will take 2-3 hours and then you will arrive at the camp where you will share a meal with us and spend the night. Next morning after the breakfast, we will take the jeep to explore the deepest areas of the Wadi Rum desert where you will see the Anfeshiyeh Inscriptions, Red Sand Dunes, Lawrence’s house and the Mushroom Stone. Followed by a cooked meal and tea by the fire in a lovely spot in the desert. Following lunch, you will take a small hike of around 30 minutes in the open area between the beautiful mountains. We then continue with the jeep to see Burdah Arch and the Abu Khashaba Canyon. There, we will walk again for about 30 minutes to appreciate the scenic landscape. 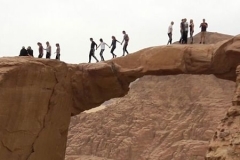 We will then take you to see Umm Fruth Rock Bridge and the sunset view and finally we will head back to the village.